Following the Workbook 1 which covered single letters, Workbook 2 is out and covers conjugate letters. 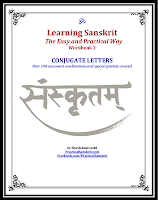 Conjugate letters (Ligatures) are integral to Sanskrit script for a very scientific reason (explained in the Workbook). This Workbook 2 covers all combinations of consonants + vowels and gives writing practice. It also lists out almost 100 ligatures, where consonants meet consonants and a new letter is formed. This is a comprehensive list, and most computer fonts don't have all of the ligatures. This 80 pages, 8.5x11 size workbook covers everything there is to be able to read classical Sanskrit. This of course doesn't mean you can understand the original texts, but being able to read the original script open doors for much more material to read, learn and enjoy. And, trust me, Sanskrit looks so much more beautiful in its own script. TO WATCH IT FULL SCREEN, click on the "Watch it on Youtube' icon (or here)on bottom right of the video frame, then on Youtube click on the 'Full Screen' icon on bottom right of the the video frame. 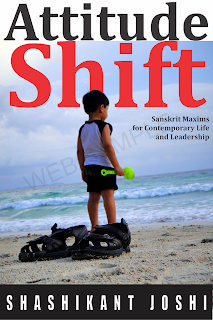 Most suitable for those who have not had exposure to Indian scripts or Sanskrit. Things covered in Workbook 1 are not covered again, so keep your Workbook 1 handy. If you have not ordered that yet you can do so now. Order your copy now. There is also a focused study group for those who are following the workbook and need help or motivation. Join it once you have started studying the workbook. Check out the available books on and about Sanskrit.